On Sunday, February 3, 2019 of Alexandria, VA. Beloved husband of Petra Mayo McCully of 61 years; loving father of Larry (Cynthia) McCully, and Marlene (Sam) Bass; grandfather of John, Katherine, Kimberly, Keith, and Margaret. Johnny was born in Hennessey, Oklahoma. He grew up and went to school in Oklahoma before enlisting in the U. S. Navy Seabees at the age of 17. After Recruit Training he served with various units including the 103rd Naval Construction Battalion on Guam, MCB-2 at Atsugi, Japan, CBD 1502 at bases in Japan and Korea and shore duty at Barin Field in Foley, Alabama. He then joined NMCB-3 in the construction of Cubi Point Naval Air Station in the Philippines where he was promoted to Construction Driver Chief and the a tour with NMCB-11 on Okinawa. Johnny was selected as AOIC of Seabee Team 1104 and deployed to Vietnam. Seabee Team 1104 was engaged in the construction of Special Forces “A” Team camps.When the camp the Team was constructing was overrun by the Viet Cong on June 9, 1965, Johnny was wounded and reported missing in action. After being rescued and hospitalized he returned to duty at the Naval Magazine Subic Bay, Naval Air Station Dallas as Assistant Public Works Officer, and returned to Vietnam with NMCB-8 as Battalion Master Chief and Alfa Co. Chief. Johnny then served with the 31st NCR, 30th NCR/COMCBPAC Det Guam, NMCB-5 in Thailand and for a short time with CBU-406 at Lemoore, CA. 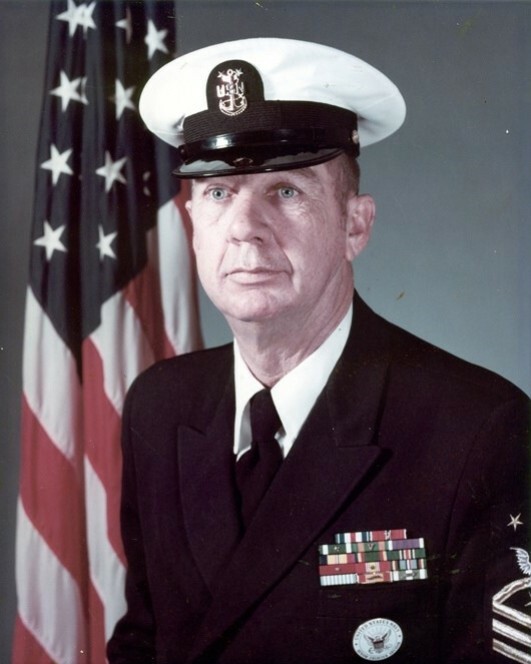 He was selected in October 1973 by Admiral Marschall as Master Chief Petty Officer of the Seabees where he served until his retirement from active duty. He returned to NAVFAC in 1982 as a civil servant working on various projects. Johnny has been awarded the Silver Star, The Legion of Merit, the Bronze Star with Combat “V”, the Purple Heart plus other personal awards. Interment will be held at Arlington National Cemetery Monday, July 8, 2019 at 3 pm. In lieu of flowers, memorial contributions may be made to the Seabee Scholarship Fund or the CEC/Seabee Historical Foundation. Please view and sign the family guestbook.